Media captionTrump election: "Nobody said democracy's supposed to be easy"
President Barack Obama has sought to assure US allies that President-elect Donald Trump will honour the country's international alliances when he takes office in January. Mr Obama told reporters that Mr Trump had "expressed a great interest" in maintaining the US commitment to Nato. During the campaign, Mr Trump said he might abandon a guarantee of protection for fellow Nato countries. His statements alarmed the Baltic states, which fear Russian aggression. Article 5 of the Nato treaty commits allies to come to the aid of a member state under attack. Who is Trump's chief strategist? However, in July Mr Trump said the US would only come to the aid of allies if they have "fulfilled their obligations to us". The US has long been pressing its European allies to spend more on defence. Mr Obama was speaking hours before his arrival in the Greek capital, Athens, on his final official overseas trip. He will later travel on to Germany and then to Peru. Security has been stepped up in Athens, where anti-US protests are planned. Mr Obama is expected to use his final foreign visit to calm nerves over the forthcoming administration of Mr Trump. The property tycoon's surprise election victory has raised concern among some world leaders after a string of controversial statements he made during his campaign. 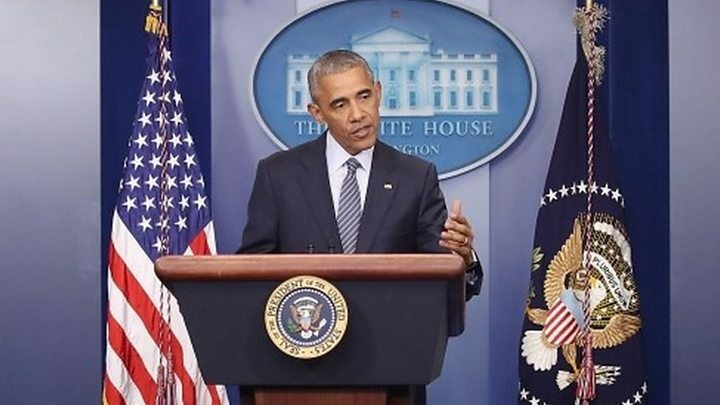 At a White House news conference on Monday, Mr Obama said his successor had "expressed a great interest in maintaining our core strategic relationships". He said this included "strong and robust Nato" partnerships, which he said would convey "enormous continuity" to the world. President Obama comes to Athens partly to talk about democracy in the place in which it was born. There's a lot for him to consider. In Ancient Greece, not far from the Acropolis, populist speakers used to rouse crowds with the promise of action against the state's enemies. Those speakers were known as demagogues. You have to wonder whether or not that will remind the president of the man who will succeed him. Modern Greece may also have some interesting lessons for the outgoing president. The recent global wave of populism had its beginnings in this country when the left-wing Syriza movement came to power in January 2015. The party's leader, Alexis Tsipras, promised to tear down a corrupt system. But almost two years on, Mr Tsipras finds himself carrying out many of the policies he had campaigned against. Mr Obama may have little clue as to whether or not his own successor will follow a similar path. But he can expect to spend much of his time in Athens explaining and even defending the motivations of president-elect Trump. Mr Obama said that in last Thursday's White House meeting with his successor, he had urged Mr Trump to send "some signals of unity... and to reach out to minority groups or women or others that were concerned about the tenor of the campaign". Mr Obama said he "absolutely" had concerns about Mr Trump but urged his fellow Democrats to accept the result and "recognise that that is how democracy works". Tuesday saw Nato Secretary General Jens Stoltenberg express confidence about the Western alliance's future. "President-elect Donald Trump stated during the election campaign that he is a big fan of Nato, and I am certain that he will be a president... who will live up to all the commitments of the United States in the alliance," he said. In another development, the Kremlin said on Monday that President Vladimir Putin had spoken by phone to Mr Trump and agreed to work with him towards improving US-Russia relations. Mr Trump has repeatedly praised the Russian president, describing him as a stronger leader than Barack Obama. Greek minister of state Nikos Pappas said there was surprise in Greece as elsewhere at the election result, but added: "Everybody would be expecting the US government to continue to be on our side." "The mood of Greek people for this political change is 'wait and see'," he said. High on the agenda in talks between Mr Obama and Prime Minister Alexis Tsipras on Tuesday will be Greece's crippling debt problems. The US and the International Monetary Fund (IMF) have urged restructuring of the debt but face resistance from EU states, particularly Germany. As preparations for Mr Obama's visit went ahead, Greek anarchist and left-wing groups announced they were planning protest marches "against the representative of imperialist powers". Police banned public gatherings in central Athens and near the city's international airport until after Mr Obama's departure. Extra officers are also being deployed. The last official visit to Greece of a sitting US president - by Bill Clinton in 1999 - was marked by extensive violent protests. Will Greek debt deal really change anything?